•	St Olave Hart Street is located on the corner of Hart Street and Seething Lane near Fenchurch Street railway station. •	John Betamin described St Olave’s as “a country church in the world of Seething Lane." The church is one of the smallest in the City and is one of only a handful of medieval City churches that escaped the Great Fire in 1666. 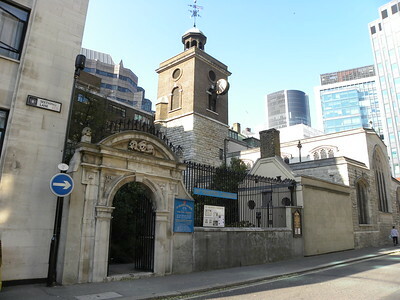 •	In addition to being a local parish church, St Olave’s is the Ward Church of the Tower Ward of the City of London. •	The church is first recorded in the 13th century as St Olave-towards-the-Tower, a stone building replacing the earlier (presumably wooden) construction. It is dedicated to the patron saint of Norway, King Olaf II, who fought alongside the Anglo-Saxon King Ethelred the Unready against the Danes in the Battle of London Bridge in 1014. He was canonised after his death and the church of St Olave's was apparently built on the site of the battle. •	The Norwegian connection was reinforced during the World War II when King Haakon VII of Norway worshipped there while in exile. •	Saint Olave's was rebuilt in the 13th century and then again in the 15th century. The present building dates from around 1450. •	The church survived the Great Fire, the flames came within 100 yards or so of the building, but then the wind changed direction, saving the church and a number of other churches on the eastern side of the City. •	The church was a favourite of the diarist Samuel Pepys, who worked in the nearby Navy Office and worshipped regularly at St Olave's. He referred to it affectionately in his diary as "our own church"and both he and his wife are buried there. •	The church was gutted by in 1941 during the Blitz and was restored in 1954, with King Haakon returning to preside over the rededication ceremony, during which he laid a stone from Trondheim Cathedral in front of the sanctuary. •	Between 1948 and 1954, when the restored St Olave's was reopened, a prefabricated church stood on the site of All Hallows Staining. This was known as St Olave Mark Lane. The tower of All Hallows Staining was used as the chancel of the temporary church. •	The church is deservedly famous for the macabre 1658 entrance arch to the churchyard, which is decorated with grinning skulls. The Charles Dickins was so taken with this that he, renaming it "St Ghastly Grim". •	The interior of St Olave's only partially survived the wartime bombing; much of it dates from the restoration of the 1950s. Most of the church fittings are modern, but there are some significant survivals, such as the monument to Elizabeth Pepys and the pulpit, said to be the work of Grinling Gibbons. Following the destruction of the organ in the blitz, the John Compton Organ Company built a new instrument in the West Gallery. •	Perhaps the oddest "person" said to be buried here is the "Pantomime character" Mother Goose. Church documents record her interment on September 14, 1586. A plaque on the outside commemorates the event. The churchyard is also said to contain the grave of one Mary Ramsay, popularly believed to be the woman who brought the Black Death to London in the 17th century. •	St Olave's has retained long and historic links with Trinity House and the Clothworkers’ Company.